In the meantime, you should definitely check out this chic linen blazer, also by Veronica Beard. This piece is the perfect neutral for transitioning seasons, as you can wear it with white, black, blue and really any other colors in your wardrobe. With it being linen, it’s slightly more casual than a wool style would be. I love pairing it with blue jeans for Casual Friday! It obviously looks amazing with white denim too for the remainder of summer. The button-sleeve details on this classic navy blazer are to die for! A subtle but super stylish update to such a timeless wardrobe staple. I didn’t try these leather pants on in the store, but if they fit as well as my jeans (in the same cut/style) they’d totally be worth the investment. Very flattering and comfortable! All of my fellow Longhorn fans need to check out this easy, breezy dress in a pretty cream + rust print, perfect for UT games this fall! In addition to debuting their denim collection this season, Veronica Beard also launched shoes! The two pairs on your list need to be these black cone-heel boots and these calf-hair mules. Obsessed! The modest neckline and tie-sleeve details on this knit make it ideal for the office. Understated but still fun! If you love rocking skirts, don’t miss this cognac leather mini. Amazing! Finally snag this comfy tweed blazer for wearing from work to the weekend, traveling or wherever. That blazer is so chic! I really like the style of the collar! Love this blazer and this cami is adorable. 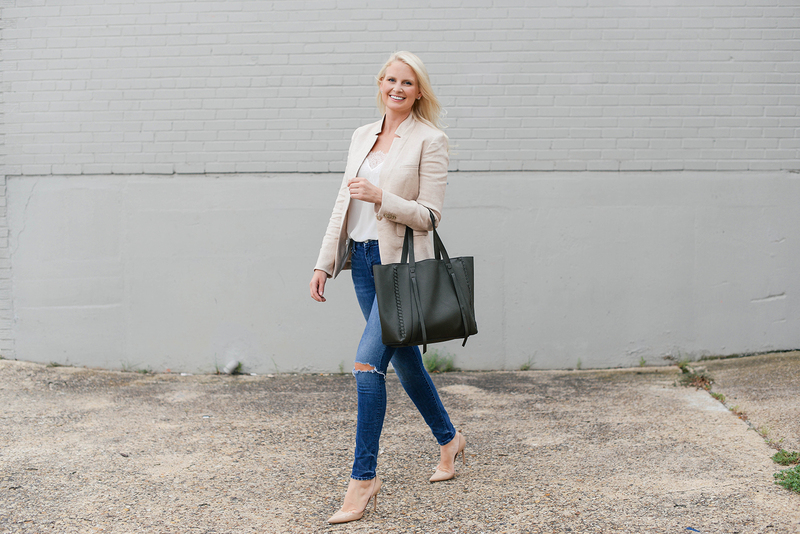 this blazer is gorgeous, but I’m really in love with this bag!!! Such a pretty color and I love the stitching detail! !